One of Britain's leading and most loved designers, Cath Kidston is best known for her vintage-inspired homewares, clothing and accessories. She began her career as an interior designer before opening her first retail shop in London in 1993, where she sold vintage fabrics and antique furniture. Now, with more than 40 stores and concessions in the UK, plus more in the Republic of Ireland, Japan and South Korea, Cath Kidston Ltd is a formidable presence on the high street. In 2010, Cath was awarded an MBE in recognition of her services to business. 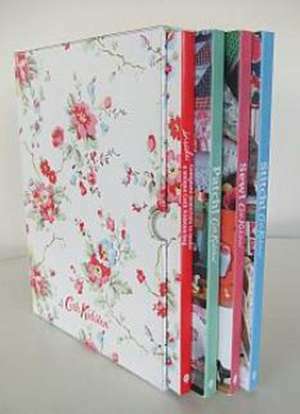 To date, Cath has published four bestselling project books - Make!, Sew!, Stitch! and Patch! - that encompass a wide range of disciplines and finished items, from sewing and patchwork to cross stitch and needlepoint. Alongside these books sit two complete kits packaged in a gorgeous tin - The Knitting Book and The Crochet Book are perfect for beginner knitters or crocheters, and make ideal gifts. In addition to her books, Cath has a very successful stationery line (published by Quadrille).